About 100 Alaskans testified before lawmakers during a public budget hearing in Anchorage on Sunday. The meeting was one of the last in a series of statewide gatherings hosted by the House Finance Committee as legislators consider a controversial budget proposal from Gov. Mike Dunleavy. The governor seeks to close a $1.6 billion budget gap with steep cuts to departments and services including education, health care and the Alaska Marine Highway System. The governor’s plans budgets for PFD payments of approximately $3,000; a compromise plan floated by House members Sunday included $630 dividends and restored funding for a range of state services. About 90 percent of the people who testified Sunday spoke out in opposition to the governor’s proposal, with many addressing funding for local school districts and the University of Alaska system. “I’m pretty disappointed across the board with the education cuts, from kindergarten all the way through advanced degrees,” said Anchorage resident Liz Snyder, an associate professor at the University of Alaska Anchorage. Those who testified Sunday included students, parents, educators and graduates who now live and work in Anchorage. They spoke in near-unanimous opposition to Dunleavy’s proposed spending plan. “This is literally the dismantling of public education,” said Anchorage School Board President Starr Marsett. 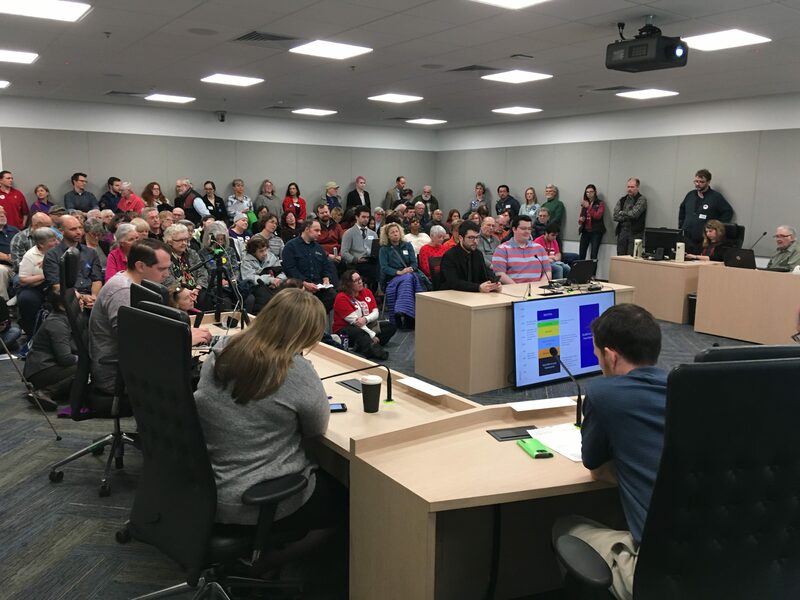 The hearing ran for more than three hours, with hundreds of Alaskans filled the Legislative Information Office to watch and listen. Lawmakers extended the meeting for around 30 minutes past its scheduled end to allow more people time to speak. For most of the afternoon, the line of people waiting to testify ran out the front door, and attendees filled every chair and two separate overflow rooms. Speaking in two-minute increments, people asked lawmakers to preserve funding for everything from Medicaid to Head Start to the WWAMI program, which allows Alaskan students to receive a medical school education while remaining in Alaska. Engineers said they feared what Dunleavy’s proposal would mean for the state’s infrastructure. Business leaders said they feared what it would mean for the state’s economy. But not everyone opposed it. Ten people told lawmakers they supported Dunleavy’s proposal. “It’s time to really look at the waste and cut the waste out there,” said Big Lake resident Bert Houghtaling. Advocates for Dunleavy’s proposal said they supported his plan to bring spending in line with state revenues. Anchorage resident Judy Eledge asked lawmakers to “fairly” distribute PFDs and cut Medicaid and education funding. “If … we see serious cuts and a balanced budget, then we would be willing to have serious discussion about dividend adjustments and perhaps a state income tax,” she said. House members held similar budget hearings in Juneau, Ketchikan, Wasilla, Bethel, Soldotna, Sitka and Fairbanks. Kirsten Swann is a producer and reporter for Alaska Public Media.